After falling in love at first sight with Maria, Freder leaves his idyllic life in the Upper City. In the Lower City he learns of the plight of the laborers and witnesses a tragic explosion. He speaks with his conniving father Joh, who instructs a spy to keep tabs on his son. Freder switches places with a laborer only to be drawn into an underground resistance, where he learns Maria is its spiritual leader. Meanwhile Joh meets with the mad scientist Rotwang and sees his robotic creation, the Machine-Man. Joh tells Rotwang to use the robot to end Maria and dispirit the resistance. Rotwang captures Maria and gives the Machine-Man her likeness. Machine-Maria ruins Maria’s reputation with lascivious public performances. She then foments an insurrection in the Lower City. The mob storms the gates and ruins the vital Heart Machine. The city begins to flood. Maria escapes her captor and rushes to the laborers city, to be reunited with Freder and save the children who had been left behind. Grot reminds the rabble of their abandoned children. Suddenly terrified, they conduct a witch hunt for Maria. They find Machine-Maria and burn her at the stake, who transforms as she is dying back into the robot. Meanwhile Rotwang has re-captured Maria. In a great struggle atop the roofs of the Upper City, Feder defeats Rotwang and saves his beloved. Afterwards at a public gathering she declares him the Mediator, a savior who was foretold to bring the long-parted classes of the Metropolis together. Laborers in the Lower City live lives of horrible dehumanization, tending to and dying in the maw of the machines. 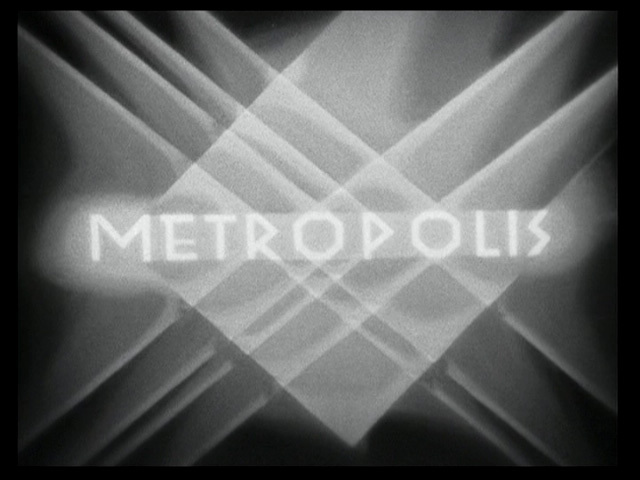 Much of the technology in the early part of the film highlights this aspect of the world of Metropolis. One shift files in as the other files out. Access to and from the machine halls are carefully controlled. Between shift changes, laborers line up in regimented rows before the gates. A device on the wall adjacent to the gate shines two square lights up top. When that light extinguishes and the circular light illuminates, the laborers know to begin walking through the gates. They trudge to large elevators, where an operator turns a crank wheel to raise the containing gate and lower the elevator. This elevator operator keeps his eyes on a gauge positioned uncomfortably high on the wall above the crank. Freder encounters the worker’s city. A laborer fails to monitor the temperature of the M-machine. One exhausted laborer has to control the temperature of the machine. He stands before a panel where a thermometer is mounted in the dead center. Its markings tell him the acceptable maximum temperature. A row of flanges and levers line the lower part of the wall. Each has a lightbulb above it. When the lightbulb illuminates, the laborer must activate that flange. The pattern of blinking lights is difficult to keep up with and the work exhausting. 11811 struggles to keep up with his task at the machine. When Feder returns to the Lower City, he sees a laborer tending a particularly pointless machine. He holds two arms on a human sized, clock-like face. Instead of numbers, the face is ringed by lightbulbs. Every half a second, the two blinking bulbs will dim, and a new completely random pair will begin blinking. The laborers task is to turn the hands such that each one points to the blinking lights.11811 struggles to keep up with his task at the machine. Feeling for his brother, Freder offers to take 11811s place at the machine. Though too fast and random to be easily sustainable, the task itself is so apparent that Feder can offer to stand in after only a few seconds of watching. Laborers of the Upper City have their own machines to worry about. Josaphat feels stress while monitoring figures. One of Johs assistants, Josaphat, has a similarly difficult task. He stands at a tall panel where lit symbols fall quickly and randomly down one of six tall, thin screens. He has to transcribe them (and possibly perform calculations with them) in one of three different books. Josaphat turns his station off. The only sensible part of this setup is the mechanism for shutting it down. Given the time pressure its operator is under, it could be disastrous if a single switch was accidentally touched. Instead, to turn it off Josephat must stretch his arms to reach two distant buttons. Touching them both shuts down the station. This seems especially prescient when considering that similar constraints informed the design of the familiar CTRL-ALT-DELETE key sequence for Windows operating systems. One of the most impressive interfaces seen in the film is Joh’s wall-mounted videophone. It is a marvel of special effects for 1927, and an ideal example that no matter how far sci-fi wants to look into the future, it must base its interfaces on the paradigms familiar to the audiences. Note in Joh’s use of the interface how the videophone is an awkward blend of early 20th century technology metaphors. The videophone is a large device, easily as tall as Joh himself, mounted to the wall of his office. At its center is a large vertically-oriented video screen that is angled upwards for easy downward viewing. To the right and left of the screen are large tuning dials. A series of knobs and controls sit below the dials. Joh checks the recent activity of the video phone. When he first approaches the device, he checks the tickertape dangling from an overhung box on the left. Not seeing anything of interest, he drops the paper and approaches the screen. Joh tunes in the channel he needs to speak to Grot. Reaching up to the right dial, he turns its hand counterclockwise from pointing at the number 10 to the number 6. Then he turns the left hand dial to 4, and the screen comes to life. It first displays the legend HM 2 at the top. Some video appears below this, but rather than a clear feed of a single camera, it is a shifting blend of different cameras. Joh must fiddle with a few controls to clear the reception. This moment seems quite strange to viewers familiar with modern video technology, since their experience is rooted in VHF broadcast, cable television, or online video. With these technology metaphors, channels are discrete. But it is important to recall that television was not popularized at the time, and the media metaphor most familiar to that audience would be radio, which users do in fact have to tune to get a clear signal. Joh picks up the phone and calls Grot. Joh verifies that hes seeing the right channel visually, by seeing Grots nervous pacing in camera view. Confident that he’s calling the right place, Joh picks up a telephone handset from the device, and reaches across to repeatedly press a button on the right. In response, the light bulbs on Grot’s videophone begin to blink and (presumably) make a sound. Joh tells Grot to destroy the Heart Machine. Grot rushes to his device, looks into the screen and lifts his handset. The two have a conversation, each looking directly at the face on the screen. This moment is another telling one. Lang was familiar with cameras, and could have had his actors talking to a lens. But instead he had them do what felt right and would make sense to the audience, i.e. talking to the other person, not the machine. In this way Lang is involved in bodystorming the right feel of technology, and in so doing is setting expectations for the way the real technology—should it ever get here—should work. His command issued, Joh hangs up on an incredulous Grot. A final note on the interaction is that, to end the call, Joh returns the handset to its resting position, and, much like a telephone, this ends the call for both parties. This seems to us like an overcomplicated mash-up of technology metaphors: telegraph, film, radio, and telephone. Of course hindsight is 20/20, but it’s not that Lang lacked the vision. He easily could have made the device more magic, by omitting the telephone handset and have Joh speak directly to the image of Grot. But Lang was not a technologist. He was a filmmaker, and needed to take his audience on the journey with him. He spoke to them in their shared language, using understandable cues to the individual components that, when added together add up to the something new that is one of the delights and promises of science fiction. Maria’s heroism in saving the children of the Lower City from flooding is aided by what may be only positive depiction of a technology in the film. Maria summons the children with the gong in the town square. To summon the children so that she can direct them to safety, she climbs a structure in the center of the town square. There she struggles with a very difficult-to-budge lever, but when she finally does so, it sets a loud gong to ringing. In keeping with the film’s theme, this brings people together so they can be saved. You know, sometimes you get the inkling that the bad guys just want to fail. Joh, the alleged brains of Metropolis, seemed to take a special delight in having his engineers develop machines that would ultimately doom his precious upper class. So you’re one of those engineers, mopping your brow and staring at whatever the Metropolis version of AutoCAD is, and you have this problem. When the machine gets too hot and close to failing, you need to vent some of that deadly, deadly steam somewhere to buy your guys some time to try and fix things before lots of people die and your civilization comes crashing down. OK. So, where to put that vent? Well, you consider putting it somewhere safe. Nonsense. Let’s instead turn that pipe this other way, and aim it like a cannon directly at the guys who might fix the problem. Be sure and jot a note at the bottom of your drawing that this will piss a lof of the dead guy’s friends off so they’ll revolt against you. Machine-Maria disables a safety switch. But OK, I hear you cry, these things are complicated, and perhaps that steam thing was just an oversight. People get busy and maybe it was rushed into production. How then do you explain the presence of a single, large, and easy-to-pull switch, the sole purpose of which is to immediately overheat and explode the one machine that’s keeping the working class and their children from being crushed under a wave of water? Thats not a slip-up. Somebody had to put that there, and somebody else had to approve it. Not to name dystopian names, but we’re looking at you, Joh Fredersen. Maybe that’s the great secret under Metropolis: Joh is the unsung good guy of this tale. The one guy who could mastermind the takedown of the terrible, oligarchical mess, all from the inside, and using his goofy do-gooder son as a pawn.